On 22 March 2017, the blog entitled: 'From the Politics of Division to the Politics of Humanity' by Willy Mutunga, was published on OpenDemocracy. "We must not give up on revolutionary optimism. It may get us some important concessions from neo-liberalism—and possibly much, much more." Ineffective policies can persist, while potentially effective policies are often not adopted. The World Bank Group published 'The World Development Report 2017: Governance and the Law' which explores why some policies fail to achieve desired outcomes and what makes other policies work. The World Justice Project (WJP) Rule of Law Index is the world’s leading source for original, independent data on the rule of law. The 2016 edition expands coverage to 113 countries and jurisdictions (from 102 in 2015), relying on more than 110,000 household and expert surveys to measure how the rule of law is experienced and perceived in practical, everyday situations by the general public worldwide. 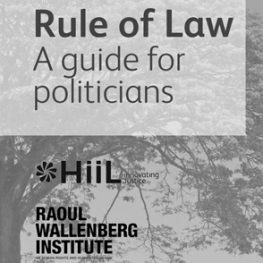 HiiL and the Raoul Wallenberg Institute of Human Rights and Humanitarian Law at Lund University, Sweden have produced a guide to the basic elements of the rule of law, geared towards politicians. Available in 15 different languages on the HiiL website.